When our four children were younger, countless outings were accompanied by rounds of “I spy with my little eye . . . ” We all scoured our surroundings in search of what was in another family member’s view and had struck the speaker’s fancy. When I write and work at home, I ordinarily stand in front of a computer monitor, facing out windows built in 1805, towards a section of grass where my husband–tender, in both senses, to the birds–installed his array of bird feeders. At a far corner of a portion of the inside porch, robins reliably arrive in early spring to build their nests and nurture their babies until they are ready to take flight. That piece of real estate is just out of my view. Lately I have been seeing a lot more of Jim’s industrious birds. They have been swooping regularly into my view, so close they sometimes brush against those 1805 window panes, making fluttery soft thudding sounds. 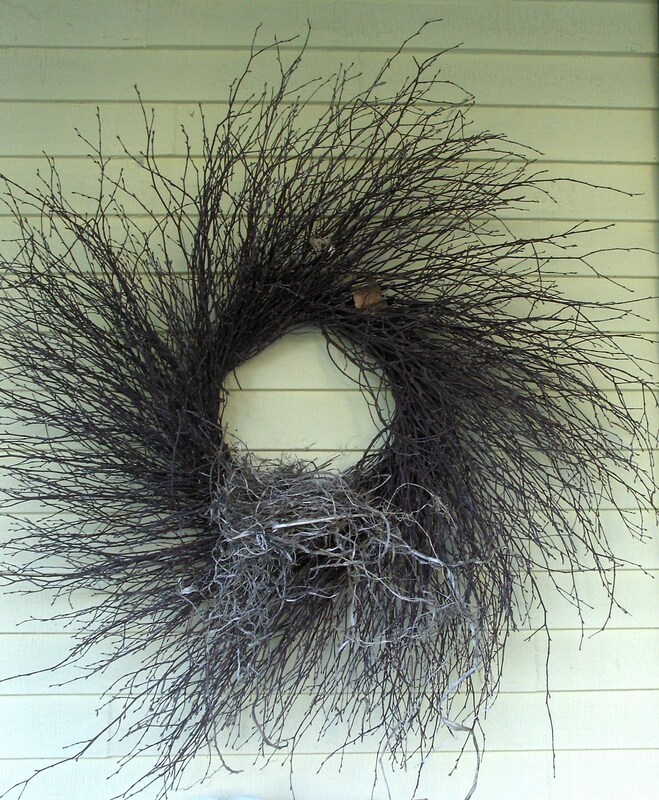 I investigated and found that there is a new prime bird location this year, twined and tangled into a labyrinthine architectural masterpiece–a manor built into the landscape of a wreath with which Jim was taken, itself made up of discarded twigs and branches. This entry was posted in Love and Loss and tagged birds, I Spy, nest. Bookmark the permalink. 4 Responses to I Spy . . .